Some hot new cards are coming soon to the Pokemon TCG! That is because Prereleases for Team Up are starting this weekend.! They will be the last two weekends of April from the 20th to 28th. If you attend an Unbroken Bonds Prerelease then you will receive one of four special art promos of cards from the set. These cards will be Melmetal, Persian, Stakataka, and Volcanion. Volcanion will be the most wanted card thanks to his first attack. This attack for one Fire energy can attach one Fire energy from your deck onto one of your Pokemon. That is nice but the secondary effect is what makes Volcanion shine. If you use this attack if you go second then you can attach three energy from your deck onto one of your Pokemon. 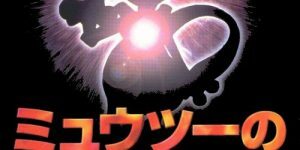 That will help speed up setting up your Charizard & Reshiram GX if you want to burn your opponent during their next turn. 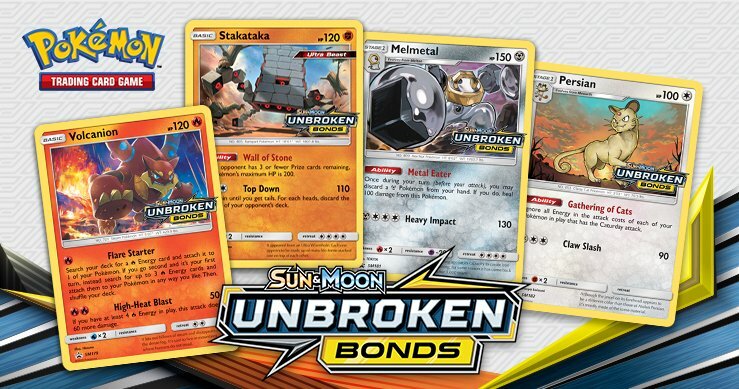 Melmetal will be making his proper TCG debut in Unbroken Bonds. This Stage 1 Pokemon has a massive 150 HP which will make it difficult to knockout with a single attack. His ability makes him even better. That is because of Melmetal’s Metal Eater ability. This ability heals 100 HP if you discard one Metal Pokemon from your hand. Persian will be helpful thanks to the Gathering of Cats ability. If you have Persian in play then all of your Pokemon with the Caturday attack can ignore their attack cost. There are a few Pokemon in this set that have this attack. The Caturday attack allows you to draw cards. Though, some of these Pokemon have attacks that actually do damage. 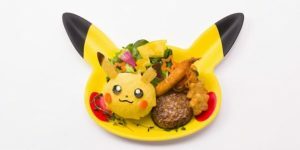 This could be helpful if you want to wear down your opponent’s Pokemon while you power up a strong Pokemon to take the knockout. Lastly, there is Stakataka with the potential to have massive HP. That is thanks to the Wall of Stones ability. This ability makes Stakataka’s HP go to 200 HP when your opponent has three or less prizes left. That means Stakataka will be staying around for a long time. If you can put enough energy on it then it could be doing some serious damage plus the potential to mill your opponent. Unbroken Bonds Prereleaes will be the weekends of April 20th to 28th. This set will be release on May 3rd and legal for tournament play by May 17th. You can find your local prereleases by clicking here.